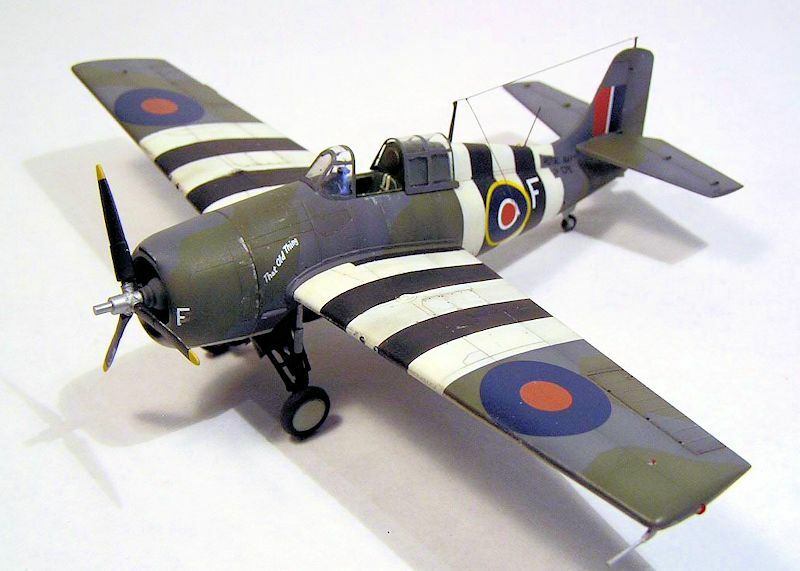 JV579, in service as “F” of 1832 Sqn, FAA, and named “That Old Thing”, is probably one of the better known Wildcats in FAA service, a picture of it is particularly widely shown. Part of contract LL00036, when photographed, probably in June 1944, it was actually quite new. The presence of the prominent “D-Day Invasion Bands” (or their “Operation Dragoon” look-alikes) is rather enigmatic, as 1832 Sqn is mentioned as serving at RNAS Eglinton (or “Eglington”), aka “HMS Gannet”, located in … Northern Ireland! ; while its “Battle Honours” include “Norway 1944”, “Atlantic 1944” and “Arctic 1944”. For a “propaganda photoshoot” it looks rather sophisticated… that led me into some “armchair research”. Delving into Sturtivant’s work, I found that the machine passed through several squadrons, namely, 1832 (2.44); 846 (4.44) and finally 759 Sqn (as 846 was renamed, 12.44), finally scraping a wing into the airstrip at NAS Yeovilton (unknown date). 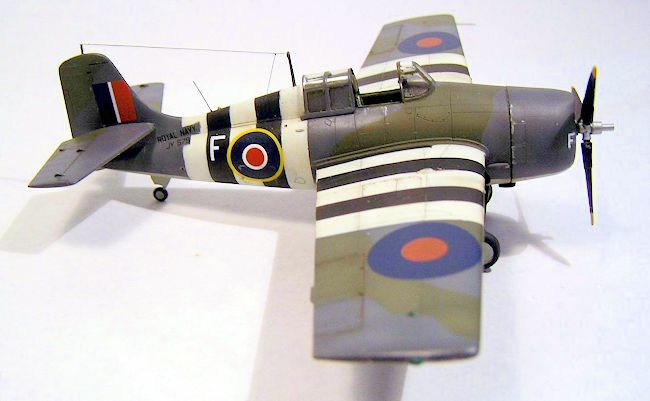 From Wragg’s history, it looks like 846 Sqn (a TBR Sqn) inherited some of 1832 Sqn’s Wildcat, including JV579, still (or at that time) designated “F”, “That Old Thing” (while it was renamed “Y3V”, keeping the surname “That Old Thing”, when in 759 Sqn); peaking to 10 machines, they were embarked on HMS Tracker, but were disembarked when the latter had a collision on 03.06.44 (no indication of naval air station). Now, 846 Sqn does have “Normandy 1944” among its “Battle Honours”. That could be the likely explanation: when depicted in “Invasion Bands”, the machine was actually in 846 Sqn service, and not in 1832’s, as the Aeromaster decals and many captions quote. This is a rendition of the excellent Hasegawa kit, in its “F4F-3 Yellow Wing” guise. 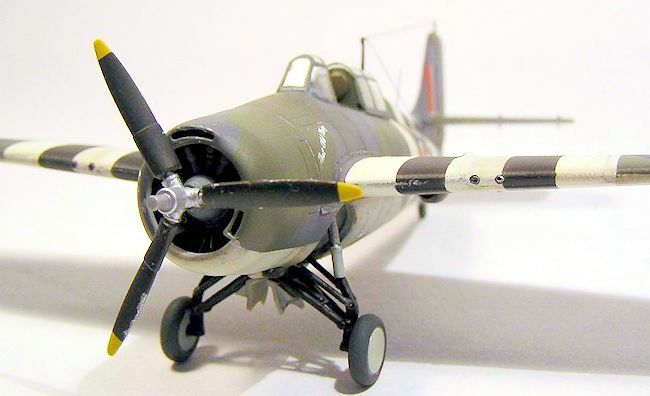 Actually, it has nothing of the intended variant, exception made of the (wrongly located for the type) four gun armament, the instructions having the modeler fill the wingfold line and the outer wing guns. It makes, however, a perfect F4F-4, provided you correct the pitot tube, and a good basis for a FM-1, filling the outer guns. As the cockpit is suitably bare, and the big wheel well is an empty, lonely space, I took an old True Details resin set, which performs admirably and it is actually a mandatory addition. A Squadron vac canopy was also added. It was mostly uneventful; the engine was detailed with some plug wiring; the TD parts virtually fell in place (yes, the harness is NOT the correct Sutton but the American one already molded in the seat…); they are barrel-shaped, so some adjustment is necessary, specially to have the undersurface windows and the wheel recesses coincide. I usually use only the hood part of the vac canopies, keeping the kit’s windscreen, for the sake of the fit. I added the gun muzzles inside the wing openings. The American-type pitot tube was scratchbuilt. Well, this was the fun part of the build. The machine being an Eastern build, it should have been painted in the so called “Substitute” colours, those from the ANA 157 Bulletin. ANA 603 Sea Grey and ANA 613 Olive Drab are uncontested, but the colour in the undersurfaces is. Some say it was ANA 610 Sky (the obvious option), while some others say that those particular machines were painted in ANA 602 Light Grey, relying on some anecdotal sources (which might be just gossip or the plain truth). I leant on the latter option. The paints I used were an old Humbrol Authentic for the Sea Grey, a modern WEMM “ANA 613” for the Olive Drab and the usual Model Master FS36440 for the Light Grey. My usual working method whenever I face “Invasion Bands” (not that I am a fan of them) is painting them after the base camouflage colour (in this case, Sea Grey) is applied, beginning with a White block masked to size, then masking the White bands and applying a Black suitably mixed with a Tan f or scale effect. Then I mask everything and apply the disruptive scheme colour. That way you avoid the marks for the camouflage colour boundaries being visible below the bands, while the dark base colour provides “instant weathering” for the White. In this scale I use hard liquid mask, so boundaries would be very visible. I made the cut out for the serial number in tape. Interior was thoroughly painted in US Interior Green. 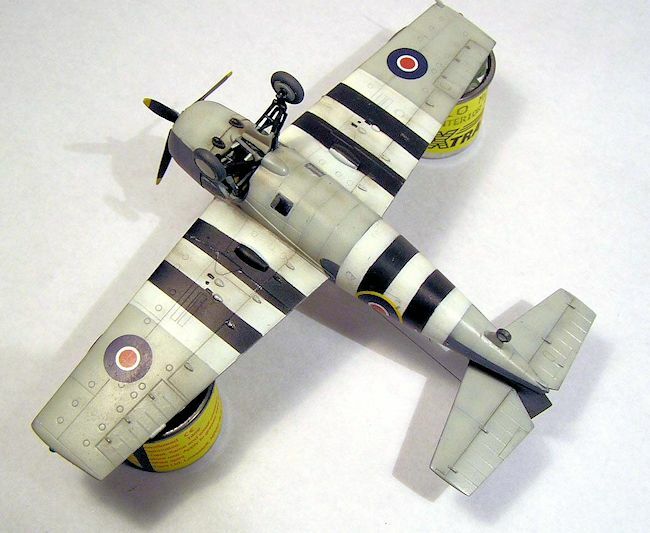 “The Grumman Wildcat in FAA Service”, Bruce Archer, Hyperscale.